Action from an exciting League Cup quarter-final between Harestanes and Bannockburn (pic by Jamie Forbes). Harestanes battled back to beat Bannockburn in a penalty shoot and reach the semi-finals of the JB Tyres Bunrigh Trophy. And the weekend’s amateur programme also produced good wins - among others - for Campsie Black Watch/Waterside and Kirkintilloch Rob Roy 21s. Harestanes needed a penalty shootout to make it past Bannockburn and into the semi-finals of the League Cup. The Kirkintilloch side dominated the first half, lost their way somewhat in the second and drew level to make the shoot-out in the final minutes. Bannockburn relied heavily on a defensive approach and the hitting on the break. Harestanes played their usual pacey passing game and should probably have been two up at half-time. Harestanes should have taken an early lead; a good run by Burns down left and lay-in to Elliot should have led to a simple tap-in, but the Hares player wanted a touch and by the time he went for goal the keeper was there to shut down for a corner. Black then had a real good chance when he stole from a defender, but shot at the keeper when he could have chipped. Against expectations, Bannockburn took the lead at the start of the second half. The ball was fired in, rattled around like a game of pinball and scrambled into the net by Darren Walker. Harestanes swiftly hit back as Fitzsimmons nodded down a cross for Welsh to slip the ball under the keeper. Harestanes then took the lead with the best goal of the match. McClune sent a long ball on for Mackie to advance at speed and cross neatly to Fitzsimmons to hit the net. Bannockburn equalised from a cross which was knocked back into the middle for a touch in by Knox and then took the lead from one of those ‘cross/meant it type balls’ from James Graham that look good as it sailed from far right to dip in just under the bar. Harestanes equalised at the end with a somewhat fortuitous goal. Mackie was again the assistant with a loose ball in which was fumbled by the keeper and hit off Quinn to land in the net. In the penalty shot-out McClune, Munn, Fitzsimmons, Cawley, Proctor, Welsh and Mackie all scored for Harestanes with Travers doing his part by saving two as Hares prevailed 7-6. Harestanes away to Giffnock North Saturday next in the West of Scotland Cup. Harestanes Tote: no winner/s – £50 rollover. Campsie Black Watch/Waterside went back to the top of the Foster’s Central Scottish Division 1A table with a good three points. 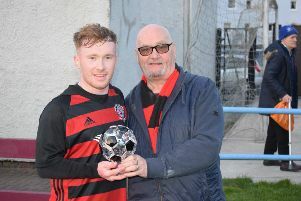 A Kevin Corr hat-trick and a goal from Aitken ensured a comfortable win in Hamilton against Mill United who had a man sent off in 40 minutes for a second booking. This Saturday CBW Waterside play at home to Blantyre AFC in the third round of the West of Scotland Cup. A last minute goal gave Rob Roy 21s victory as they made it three wins in a row at Glasgow Green on Saturday. Straight from the start the home team pressured but Rob Roy’s defence stayed calm and thanks to some brilliant goal keeping from Ross Williamson the scoreline stayed 0-0. The Kirkintilloch team then broke up the park with Armstrong and McIlkenny combining well with an exchange of passes to earn a corner, and a great delivery by Irvine which was headed in by Armstrong to put the away team in front. Rob Roy grew into the game with more confidence and Hughes tested the keeper a few times. From another break McIlkenny did well to earn a corner and this time Kerr, who had come on as a substitution for Irvine, took the corner which was well met by Krausen to put make it 2-0. Rabs went three up when Hughes latched onto a pass and guided the ball into the top corner. Glencairn applied pressure and pulled a goal back just before half-time when the ball was tapped home after a corner wasn’t cleared. After the break the home team cut Rob Roy’s lead to 3-2 when they picked up a loose ball in the middle of the park and went through on goal to score. The Rutherglen side started to dominate the last 20 minutes of game but Rob Roy were defending superb and dealt with all until a Glencairn midfielder played a clever through ball to the striker who finished in off the post. It looked like a draw was going to be the result but with seconds left Rob Roy broke on a quick, rare counter attack and Hughes drilled a low cross to Armstrong who got his foot on it brilliantly after losing the defender to take all three points. Man of the was Connor Hughes. This Saturday Rob Roy are at home to Arthurlie Juniors 21s in the West of Scotland Cup. Lenzie YC 2001 under-16 have boosted thir hopes of deenmding their CKDYL title with three wins in four weeks. In the first game away to EDFC a 9-2 win was achieved with goals from Thomson (3), Tolland (3) Dudman, Inglis and Dougla. That was followed by a 2-1 win over last season’s runners up Gartsherrie, goals coming from Tolland and Thomson. And on Saturday there was a hard earned 3-1 victory over Baljaffray with Thomson and Douglas (2) getting the LYC goals. This week Lenzie are away to Calderbraes BC. Lenzie’s Central League 2002B produced a battling performance as they came come back from behind three times to earn a point against Craigpark Colts. Lenzie went down in the opening minutes when the ball squirmed in in the heavy Boghead pitch but got a goal back when their twin strike force combined to release Lewis Gargano who finished well. Lenzie were under pressure going up the slope in the second half but defended really well with Ben Street and Lewis Crawford mopping up everything. Colts got in again to go ahead but Lenzie kept battling and, using the ball better, created a few chances before Joni Loch hit home the equaliser. Referee’s player was Max Wheadon who covered every blade of grass to keep Lenzie going.